A position of relative weakness for men’s basketball over the last two seasons has suddenly become one of immense strength as the Florida Gators officially announced on Monday that center Patric Young will return to school for his senior season. After spending his first year with the Gators as a reserve, Young has served as Florida’s starting center over the last two seasons, averaging 10.2 points and 6.4 rebounds in 26.5 minutes per game in each campaign. Donovan has chided Young for his consistency on occasion in order to get the absoulte most out of him on a game-to-game basis but the two have a great player-coach relationship. Young likely would have been a second-round pick in the upcoming 2013 NBA Draft had he declared and left school early. Though stretch-four Erik Murphy (6’10”, 238 lbs.) had started alongside him, Young (6’9”, 249 lbs.) has been the Gators’ true big man and the only player on the team who could legitimately play center for an entire game. That will not be the case next season as, with Young returning, Florida will boast arguably the best frontcourt in the nation. Joining Young, the two-time SEC Scholar-Athlete of the Year, will be junior transfer Damontre Harris (6’10”, 228 lbs.) and five-star freshman Chris Walker (6’9”, 220 lbs.). Forwards Will Yeguete (6’7” 240 lbs.) and Casey Prather (6’6”, 208 lbs.) will both return for their senior seasons, and Florida will finally get to see sophomore transfer Dorian Finney-Smith (6’8”, 205 lbs.) in action. The Gators will be able to rotate at least six players in their three frontcourt positions but will need to develop the backcourt after losing starting guards Kenny Boynton and Mike Rosario to graduation. Point guard Scottie Wilbekin will be the only other returning member of Florida’s starting five aside from Young. Someone was telling me Finney-Smith is our best player in practice. Guess at next season’s starting %? Wilbekin, Young, Frazier, Prather, Walker is my first guess. Yes to Finney-Smith. No to your starting %. Haha. Starting 5. Hill, Wilbekin, Finney-Smith, Yeguete/Walker and Young. I agree on the line-up. Still interested to see if Walker meshes into the team, especially on how he responds to competition for position. I also really hope that we see some major improvement from three current freshmen moving into next season (and hopefully no transfers). We will really need them to improve and provide next years team with some back-court depth. Right now it looks as though our main outside scoring threats will be Hill and Frazier, with Wilbekin providing some secondary scoring. Need at least one other guard to step up (IMHO). One of the great thing about next year is we will be able to do so many different things with the players we have. If we need to go 3 guards we can. If we need to go big we could go big. If someone is dragging we will have a backup for every position (or almost every position SG is still to be seen). I would have been far more surprised if he had announced he was leaving, he seems far to intelligent to know that would not have been a winning move. As to starting lineups, I suspect that the starting lineup at the end of the year will look very different from the lineup at the beginning of the year if the 2 studs coming in are anywhere close to being as advertised. All I know is that Hill is the best passer this team will have had since Calathes. well at least he was in HS, adjusting to the college speed and size is yet to be seen. Ogbueze was expected to come in and be huge impact, and virtually never saw the floor. It will be an interesting few weeks to see how this shakes out. You always got the impression that Patric Young stepped to the beat of a different drummer and this is a great decision that confirms he’s a special kid and a unique young man. He sounds like a class act too. Things will no doubt continue to go well for him with that attitude. Of course, as a Gator, I also couldn’t be happier for our basketball program to have him back. Next year, it will again, be GREAT. . TO BE. . . A FLORIDA GATOR!!!! Plus, on an NBA level, he’s much more of a power forward than a 5. . . this move might give him a chance to work on his 4 skills. Good deal all the way around! Love it! It will be so nice to have more depth up front! We’ll see……Could be hard to keep Frazier off the court. I agree. Frazier was huge as a true freshman this year. If he makes that big jump that most players make in their 2nd year, he should be a big part of our team next year. Well…our team has a good dose of humility then. They seem to accept the hierarchy of sports at UF. Great choice by PY. Stoked to have him back. BD has done a great job recruiting and building a team that will have a great line up next year. 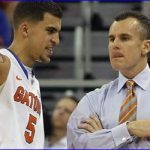 It’s great to have Billy D and it’s great to be a Florida Gator!